JERUSALEM (Reuters) - Israel's upgraded ballistic missile shield became operational on Wednesday, in a "Star Wars"-like extension of its capabilities to outer space where incoming missiles can be safely destroyed. The Defence Ministry said the U.S.-funded Arrow 3 system, jointly developed by state-owned Israel Aerospace Industries and U.S. firm Boeing Co. , was handed over the Israeli Air Force. 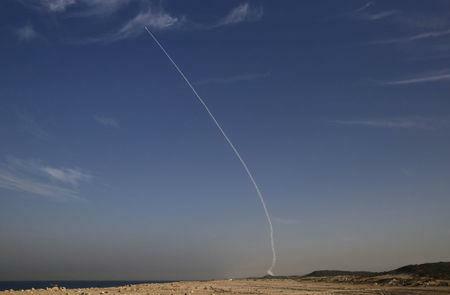 The Arrow 3, together with the Arrow 2, which has been operational since 2000, would "significantly reduce the possibilities of ballistic missiles" hitting Israel, the ministry said in a statement. The Arrow 2 is designed to intercept projectiles high and low within the atmosphere. Arrow 3 missiles will fly into space, where their warheads detach to become "kamikaze" satellites that track and slam into their targets. Another Israeli system called David's Sling is being developed to shoot down mid-range, lower-altitude missiles, such as those in the arsenal of Iranian-backed Hezbollah, a Lebanese group which last fought a war with Israel in 2006.